All of my candy lilies have finished blooming and seeds have started to ripen on the stems of my plants. Two years from now my garden will be filled with these beautiful flowers. Not only did this perennial provide me with interesting flowers during the growing season-but watching the seed development has been just as interesting and informative. Since this was the first year the candy lilies bloomed in my garden I was a little surprised at the rate seed pods ripened from plant to plant. If you look at the image on the left you can see seeds that are still green even as the seed pod has started to split. My confusion stemmed from the fact that I'd only ever seen black candy lily seeds and when mine didn't appear to be black as the pods split I thought maybe something had gone terribly wrong. I left the seeds on the plants even after the pods opened up completely hoping that they'd turn the familiar black color on their own. About a week later the seeds did in fact ripen to the black color you see above. I'm surprised at how strongly the seeds are fixed to the pods because even with rain, wind and the occasional person brushing against them they didn't fall off. Yesterday I noticed a new batch of seed pods had begun to split and the seeds were already the shiny black color you see in the image above. I guess the first batch of seeds this season was a little eager to get underway. Here's a garden video I made of me showing how to collect Candy Lily seeds in my garden. Now this makes me even more determined to try blackberry lily next year, and if I get that through, then have a go at candy lily. 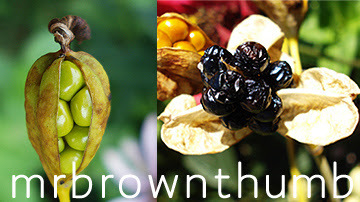 The seeds are just as attractive as the flower, aren't they? You know I was just thinking about seeds today and I'm starting to think I'm more of a seed grower than gardener. I find myself getting more excited about getting plants to produce seeds than I do about getting them to bloom. Going through some of your old posts and found this. Candy Lilies are one of my favorites. Never know what the flower colors will turn out like but I did know everyone would be special. Your flowers are great. I like the second to the last one. The dark purple one is great. Do you have any candy lilies seeds available now? If so, could you please give me some or are you interested in exchanging them with my seeds ? I have saved some seeds from the plants I grew.I like this tree but I don't know where to find it in my area. Sorry, I don't have any candy lily seeds at the moment. Check back in the fall. Oh WOW! :) :) :) It is SOOOO nice to meet you, for a bunch of reasons after reading so many of your GREAT posts today... LOL!! But SERIOUSLY,... I've had a 'Candy Lily" for about 10 years now. At least that's what I THOUGHT it was called, I'd lost the tag their first season, and it was just a hunch when it came time next yr to see it.. I dredged it out of my memory bank, with little confidence I must say. AND, I've NEVER seen anyone else with photos of one! Or others like your readers discussing them either!  I LOVE to collect the seeds as well, they're fun! Though to date I've not yet even begun trying to plant them. I'd originally planted a whole row (12 ish) of these babies 13 yrs ago, and the dog took care of all but TWO the following 2 yrs. So for the last 11 I've had one or two plants show up each late summer/early fall. Generally only see about 3 flowers total oon the plant, and its blooms are the most yummy color combination - a brilliant deep buttery gold, changing to a gorgeous coral, and reddish-orange rather like an ombre or gradient effect. (It’s planted in my 'hot corner' with my Red Hot Poker flowers that look like the top rt here: http://en.wikipedia.org/wiki/Red_Hot_Poker which ironically says these are only hardy to Zone 6, and I’m 4b or 5 depending on which scale is used… ;)P ). The ODD thing, is that it seems to stay in one location for 2 yrs, then a few feet away the other one will bloom for 2ish yrs, and they seem to alternate back and forth, RARELY do I get BOTH plants at same time. Frustrating as hell, but always a delight when I see them, Especially as the Beautiful blooms just Do Not Last long. Not sure if it's because it gets so danged hot here in Northern Colorado when they're blooming, or if that's natural for the plant or what. I’m now wondering if perhaps you happen to know the latin name? Is ‘Candy Lily” their Official layperson name? Because I recall searching 2 years back for candy lilies and I did NOT get what I was expecting to see. I'd LOVE to get it from you so I can do some research about these babies. I also noted that you said you get Different colors?? (gasp!) Wonder if it’s because of a different variety, or are they all supposed to be kind of random? They were developed by Park's and they are expected to have all those color variations. "Park's Candy Lily Seeds" with Iris-Like Blooms in Every Color of the Rainbow! How should I store the seeds over the winter, for spring planting?